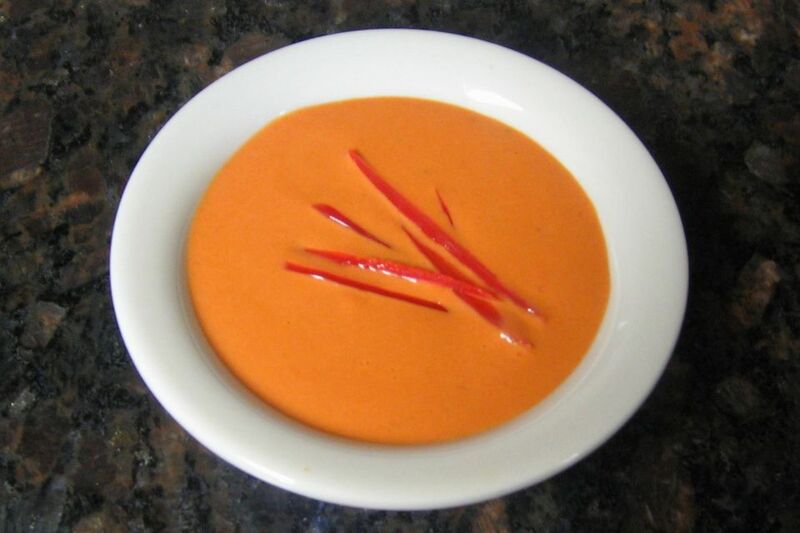 This roasted red pepper sauce is easy to prepare and full of flavor. Drizzle the sauce over baked or grilled fish or serve it with a quiche. It makes an excellent garnish for a thick cream soup, too. Roast the red pepper over the open flame of a gas burner or under the broiler, turning frequently to char the skin thoroughly. Immediately put in a paper bag or plastic food storage bag to steam and loosen the skin. Meanwhile, melt the butter in a saucepan over medium-low heat. Add the green onions to the butter and sauté for 1 minute. Peel the bell pepper and remove the seeds and membranes. Chop and add to the green onions in the saucepan. Add 1/4 cup chicken broth and simmer for 3 minutes. Remove from heat and let cool slightly. Add the bell pepper mixture to the blender, along with the ground hot pepper; blend until the mixture is smooth. Rinse out the saucepan used to cook the pepper mixture. Strain the red pepper mixture through a sieve into the saucepan. Add cream and tomato paste. Whisk over low heat until thoroughly heated. Add salt and pepper to taste. If desired, serve in a small dish with a garnish of thinly sliced red bell pepper, cilantro, or parsley sprigs. Serve with quiche, as a garnish for cream soup, or with mild white baked or broiled fish. You'll find many uses for this tasty sauce.